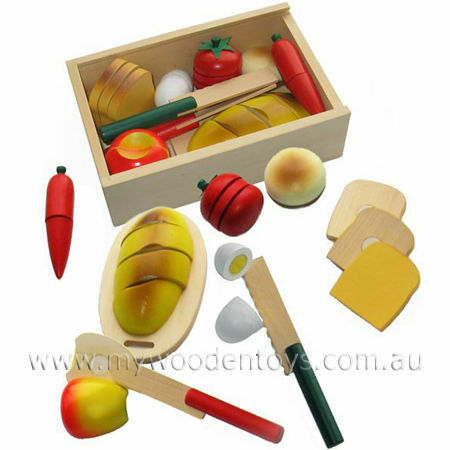 Wooden Play Food Picnic Box is a set of different foods held together with Velcro that can be cut with a wooden knife. This lovely set contains 3 pieces of bread, a bread roll, a loaf of bread, an egg, a chilli, an apple and a tomato. It also comes with a chopping board and 2 knives. All the food can be cut and breaks into 18 separate pieces. Very well finished in a lovely wooden box with a perspex lid this is a solid toy. A great way to learn about different foods and a lovely toy for those Teddy Bear picnics. Material: Wood, Child -safe paint, Perspex lid. We like this because: "It is packed full of things to cut and little fingers will be safe."